A fact error isn’t a major concern compared to having a gunman on campus. Yesterday the gunman on campus wasn’t hundreds of miles away at Northern Illinois University or Virginia Tech. 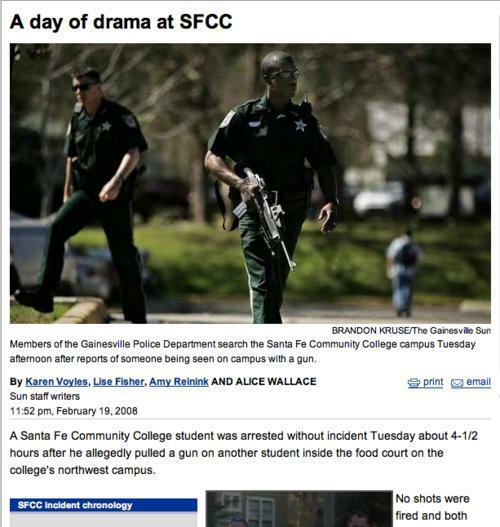 The gunman was 10 miles away at Santa Fe Community College. No one was shot. The gunman was captured. But he did have a loaded gun on campus, which he allegedly threatened another student with. He was on the loose for more than five hours before police found him in an apartment complex. I learned about the gunman from one of my students as she and I were walking to class. Her friend had just called that another friend was locked in a classroom at the community college because a gunman was on campus. My student and I arrived at our auditorium — with three doors that I can’t lock and that all open outward, so the doors couldn’t be barricaded. I checked the computer in the classroom and read the news brief on The Gainesville Sun Web site. The gunman hadn’t been found based on the 2:15 post. Class would start at 3 p.m. I alerted my teaching assistant and our guest speaker. We went on with class as normal. I sat on the top row of the auditorium, next to the doors at the back of the auditorium. About 15 minutes into class, one of those doors opened. I turned. I was so relieved to see a tardy student that I recognized. A fact error isn’t a major concern compared to having a gunman on campus. Yesterday the gunman on campus wasn’t hundreds of miles away at Northern Illinois University or Virginia Tech. The gunman was 10 miles away at Santa Fe Community College. No one was shot. The gunman was captured. But he did have a loaded gun on campus, which he allegedly threatened another student with. He was on the loose for more than five hours before police found him in an apartment complex. I learned about the gunman from one of my students as she and I were walking to class. Her friend had just called that another friend was locked in a classroom at the community college because a gunman was on campus. My student and I arrived at our auditorium — with three doors that I can’t lock and that all open outward, so the doors couldn’t be barricaded. I checked the computer in the classroom and read the news brief on The Gainesville Sun Web site. The gunman hadn’t been found based on the 2:15 post. Class would start at 3 p.m. I alerted my teaching assistant and our guest speaker. We went on with class as normal. I sat on the top row of the auditorium, next to the doors at the back of the auditorium. About 15 minutes into class, one of those doors opened. I turned. I was so relieved to see a tardy student that I recognized.